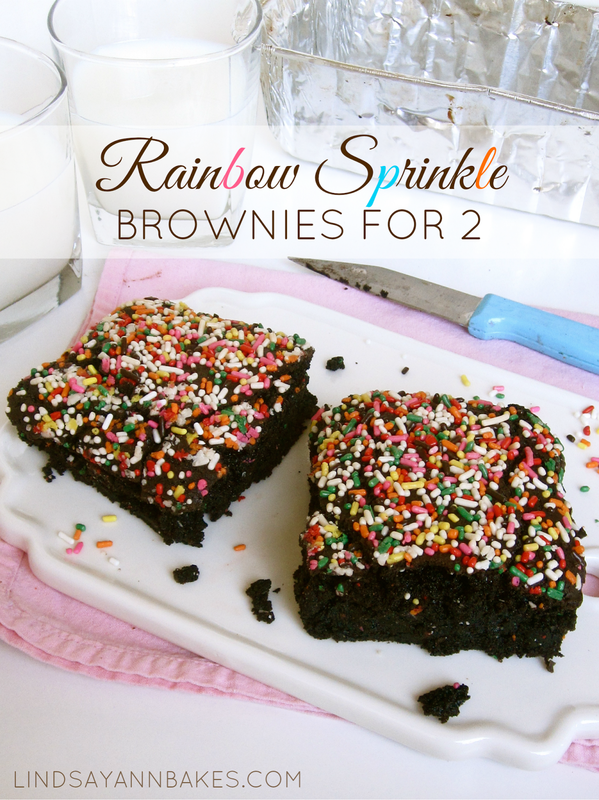 This small-batch of ultra fudgy brownies, topped with a thin crispy top crust of rainbow sprinkles is a perfect recipe for two! With Valentine's Day around the corner, these are the perfect, easy-to-make, quick-to-bake, perfect-amount-to-enjoy, dessert. I love baking in small batches because after my one perfect square of pure chocolatey decadence, there is no plate of leftovers tempting me in the kitchen! This way I can have my dessert without over indulging and eating half a pan of brownies with a fork before they've even fully cooled ;) GUILTY as charged! The recipe is so simple! It comes together right in one pot, and you get the most fudgy, moist, chocolate brownies with that perfectly crackley, candy coated crust on top from the sprinkles. Preheat the oven to 350 degrees F. Line an 8 inch square pan with foil or parchment paper and spray with non-stick spray. Melt butter in a saucepan over medium heat. Reduce heat to low and add the sugar, chocolate, and cocoa, stirring with a wooden spoon until smooth. Remove from heat and stir for about a minute to cool mixture. Mix in the vanilla extract and egg. Stir vigorously for about 1-2 minutes until batter becomes thick, smooth and shiny. Stir in the flour, baking powder and salt, until just incorporated. Pour batter into prepared pan. Top with sprinkles. Bake for about 35-45 minutes. An inserted toothpick will come out with moist crumbs sticking to it. Do not over bake. Cool brownies completely in the pan on a cooling rack before cutting. Once completely cool, slice in half and enjoy. Get creative and use your favorite toppings! Check out more single serving sweets & treats for two on my Pinterest page!